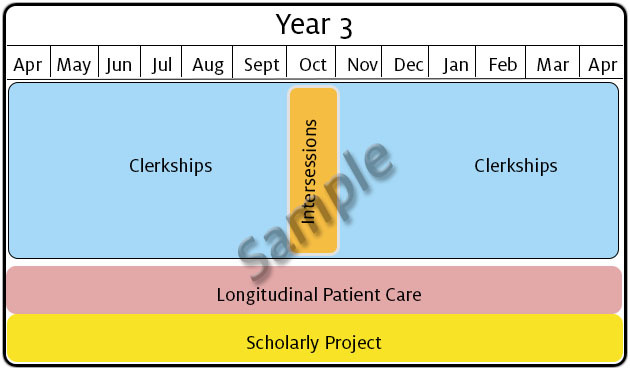 Clerkships – Year 3 clerkships, which begin immediately following the Transitions to Clerkships block, are composed of 50 weeks of core clerkships, each of which includes an orientation that prepares students with information and skills needed in the specific rotation. Students will have ample opportunity to engage in patient care both in inpatient as well as outpatient settings. Intersessions – The Intersessions course is designed to provide the opportunity for all third- and fourth-year students to return to campus to engage in content that is best addressed while students are actively involved in patient care. Intersessions also allows students to come together as a class for collaborative and reflective time as they are progressing in their journey of becoming a physician.